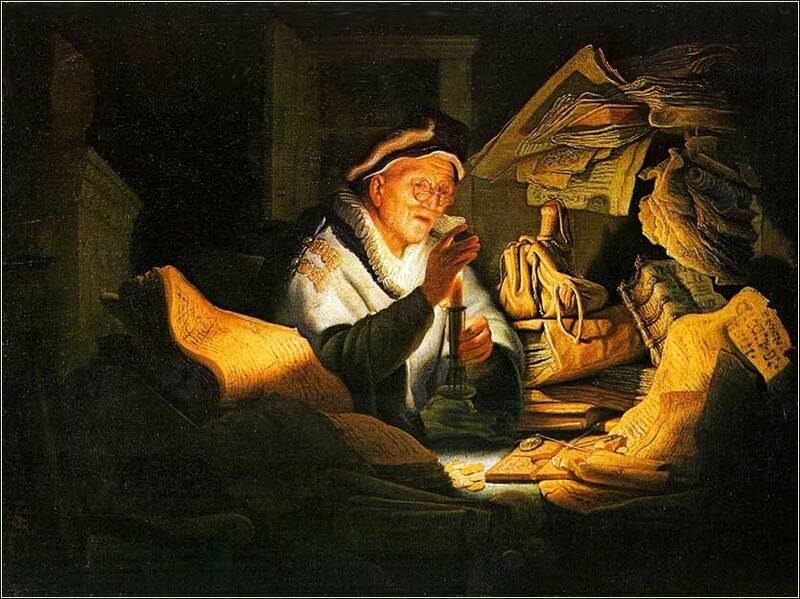 Parable of the Rich Man, Rembrandt ca. 1627. Rembrandt illustrates the parable of the rich fool, as told in Luke 12. At night a rich man studies one of his golden coins. In the early 17th century a stack of books was often used as a symbol of vanity. The Hebrew letters suggest a biblical setting. 175 people in our community are currently praying with you. Almighty God, as I cross the threshold of this day I commit myself, soul, body, affairs, friends, to Your care. Watch over, keep, guide, direct, sanctify, bless me. Incline my heart to Your ways. 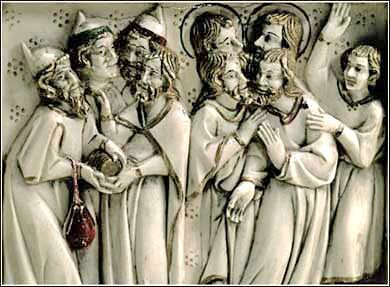 Mold me completely into the image of Jesus, as a potter forms clay. May my lips be a well-tuned harp to sound Your praise. Let those around see me living by Your Spirit, trampling the world underfoot, unconformed to lying vanities, transformed by a renewed mind, clothed in the entire armour of God, shining as a never-dimmed light, showing holiness in all my doings. Let no evil this day soil my thoughts, words, and hands. May I travel swampy paths with a life pure from spot or stain. In every transaction let my affection be in heaven, and my love soar upwards in flames of fire, my gaze fixed on unseen things, my eyes open to the emptiness, fragility, mockery of earth and its vanities. May I view all things in the mirror of eternity, waiting for the coming of my Lord, listening for the last trumpet call, hastening unto the new heaven and earth. Order this day all my communications according to Your wisdom, and to the gain of mutual good. Forbid that I should not be profited or made profitable. May I speak each word as if my last word, and walk each step as my final one. May God Almighty send me his light and truth, to keep this day and all the days of my life. And may His mighty hand protect me, and all my brothers and sisters who have joined me in prayer this day, blessing our homes and our lives. There is a strong tendency, in groups of profoundly dedicated Christians, towards communalism. In fact, some the most dedicated Christians — monks and nuns — take vows of poverty and live an absolutely communal life, not owning even the clothes on their back. But outside of monasteries, these communal experiments have been failures. It would make sense that Christians, whose lives becomes so centered on the Spirit that mammon becomes a burden, would gravitate toward socialist existence; but what makes sense often conflicts with truth, and this seems to be an example. Large-scale socialist societies have almost universally been characterized by atheism, ranging from the rather lackadaisical scorn for religion in much of northern Europe to the aggressive persecution of Christianity in Marxist countries. Indeed, the increasingly socialist United States is experiencing a concomitant rise of outspoken anti-Christian sentiment. The Bible does not condemn or even discourage socialism. Nor does it promote it. In fact, if one were to sum up the New Testament's attitude toward politics, it would be "stay out of it." The prohibitions against theft in the Old Testament definitely presuppose, without criticism, a society where individuals may own land and items worth stealing. This becomes more apparent as one reads along: we will see the laws regarding property and theft greatly fleshed out in Exodus 22:1-14. The Eighth Commandment — because it is so strongly emphasized — seems to imply that theft is an even faster road to spiritual ruin than wanting to get rich. This in no respect conflicts with the New Testament: Theft places ownership of goods ahead of our love for our neighbor and, thus, our love for Christ. It embroils a lot of people in controversy over earthly goods. So let us not covet the rich, or despise them, or judge them, or think it all right to steal from them. We must love all, rich and poor alike.